In this puppet/human effort directed by Brian Henson, son of Muppets creator Jim Henson, Bill Barretta voices the top puppet character known as disgraced burnout Los Angeles-based private investigator Phil Phillips, who has to get to the bottom of a series of murders among the stars of a decades-old television show with a puppet cast of actors called, “The Happytime Gang”. 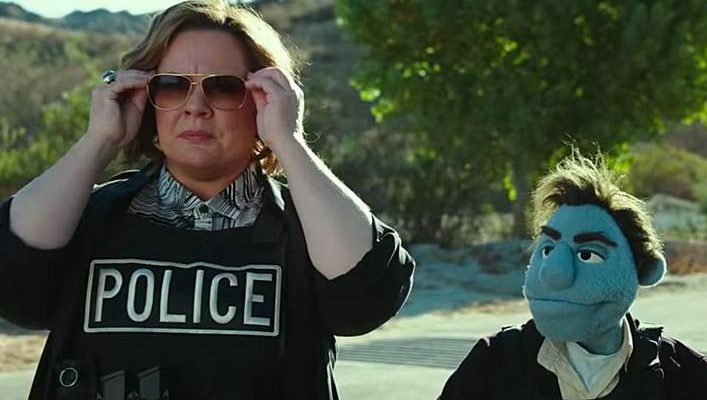 Melissa McCarthy gets the top human role, playing police detective Connie Edwards, Phil’s former, now estranged, partner in crime-fighting from his days on the force, who joins in to reluctantly assist. Even if the characters look like Muppets, it’s a very raunchy, ultra-violent effort not meant for children.